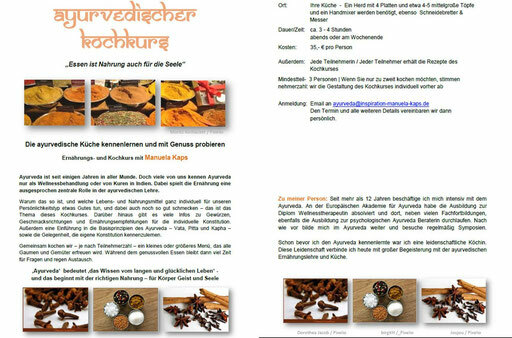 Buchen sie mit Manuela den persönlichen ayurvedischen Kochkurs in ihrer Küche und ihrem Freundeskreis. I've been surfing on-line greater than 3 hours these days, yet I never discovered any attention-grabbing article like yours. It is lovely value sufficient for me. In my view, if all webmasters and bloggers made just right content material as you did, the web might be much more helpful than ever before. You are so cool! I do not suppose I have read something like this before. So nice to discover someone with some unique thoughts on this issue. Really.. thank you for starting this up. This website is one thing that's needed on the internet, someone with some originality! Woah! I'm really enjoying the template/theme of this blog. It's simple, yet effective. A lot of times it's tough to get that "perfect balance" between usability and appearance. I must say that you've done a fantastic job with this. Additionally, the blog loads very fast for me on Internet explorer. Exceptional Blog! Thank you for the good writeup. It if truth be told was a enjoyment account it. Glance advanced to far brought agreeable from you! By the way, how could we be in contact?